I don’t mean the restaurant only. I used to start off our restaurant review with a image of the restaurant front like the one above. From now onwards, I don’t need to do that anymore. I can do better. Alright … back to the restaurant. 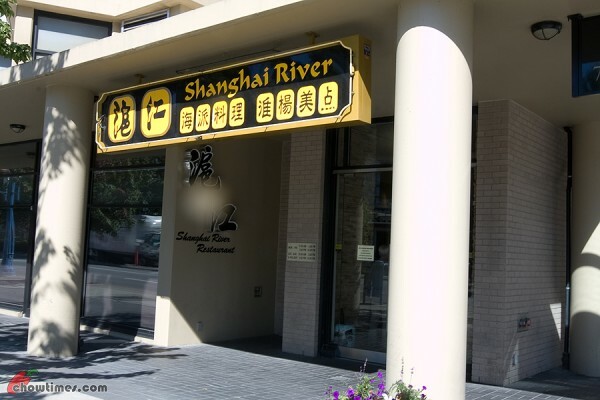 Shanghai River is one of the more popular Shanghainese restaurants in Richmond and they are successful for several good reasons too. 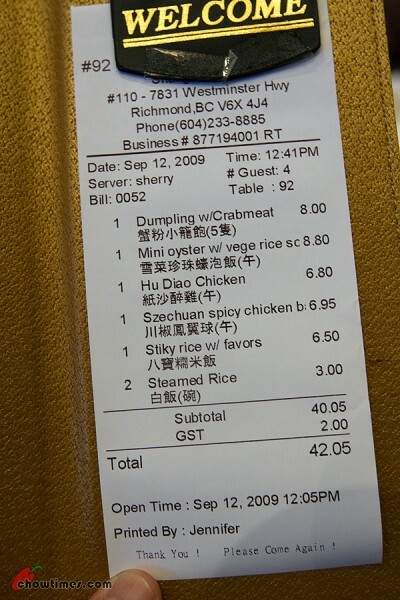 This restaurant is located on Westminster Highway, just west of No 3 Road. Parking is at a premium in the covered parkade just right of the restaurant. You have to be careful where you park because the stalls are marked. Reservation is highly recommended at Shanghai River. We were there early at 11:15AM without a reservation and had to wait 30 minutes for a table. The restaurant is large and they turn the tables quite fast. Even then there is a long line. At about 11:30AM, they were already turning away walk-ins and even the calls for reservation for lunch that day. We were just by the waiting area and overheard the incoming phone calls. That tells us we are in the right place. Bright lightings, tables with double layered table cloth and comfy chair … polite waitresses … efficient and courteous service. They even have a bar. see From these alone I would have thought that this will be a pricey place. I was quite wrong. The dining area is bustling and very noticeably noisy. 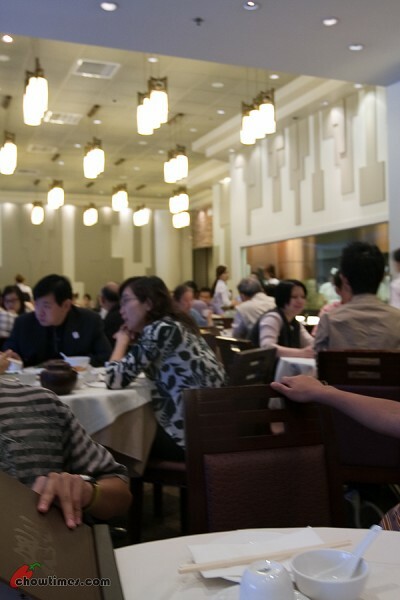 Do you think Chinese talks too loudly when dining? LOL! I think we do. I love their menu. 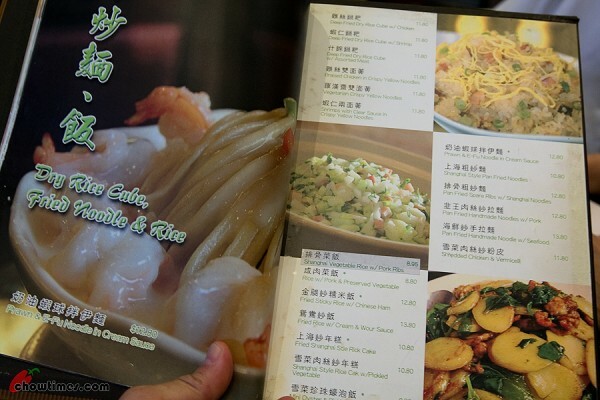 All menus should be like these … well laid out with pictures and English translations. I was thinking that Gweilos would be very comfortable with eating here. Just point to the pictures you fancy and you’re set. I used the word Gweilo in an affectionate way OK? Maybe I should use the word Sai Yan to refer to Whites or Causasians but the term Gweilo sounds more personal. Anyway, the surprising thing was that a lot of their Shanghai Style Dim Sum items are under $10 and even main dishes are at the range of $12. 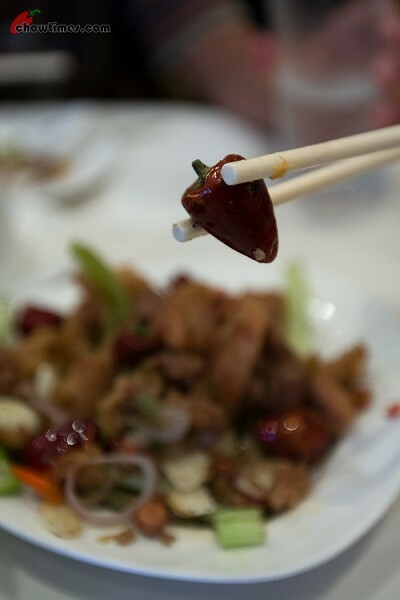 Unlike many Chinese restaurants, Shanghai River’s service is exceptional. The staff were very polite and cheerful to us. I can’t help but notice how well-groomed, young and well-trained the staff are. Their uniform is well fitted. Really, it tells me that they are like the Cactus Club with an Asian twist. I just like them, especially because they were so busy and yet able to appear composed at the tables. On the menu, they call themselves the Master of Dim Sum. Like any respectable Shanghainese restaurants, they have an open glass enclosed kitchen where they make Xiao Long Bau in plain view of the diners. They have stacks of bamboo baskets so I guess they are very popular here. 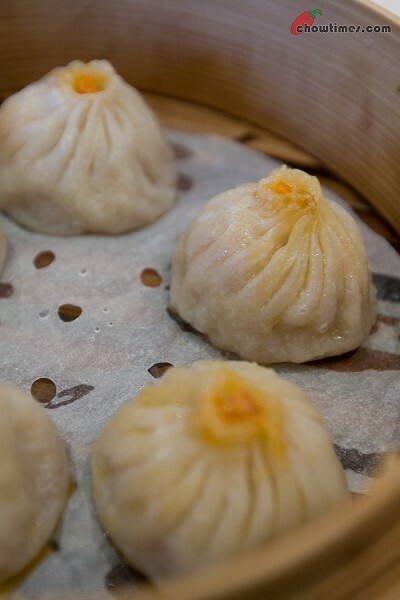 BTW, for those of you who don’t know … Xiao Long Bao literally means mini dumplings in bamboo baskets in Mandarin. We decided to get something special. Instead of the normal Xiao Long Bao, we had the Shanghai Dumpling with Crab Meat. It is beauty. They make it very well. The skin is of the right thickness and is very … soupy on the inside. But the top is a bit dryish and not as moist as one would expect all round. Not sure why it is that way though. Other than that it would have been perfect. This crab meat version is the pricier of their Xiao Long Baos. It is $8 for 5 pieces. We never touch the vinegar and ginger slivers. We never quite like vinegar at all. This is like comfort food for us — rice in soup. Yeah, we like these just like the way our mums make it at home when we were young. I remember when I first had dinner at Suanne’s house, I was quite taken aback that her mum served everyone with their individual bowl of soup … huge bowl that could easily serve a family. 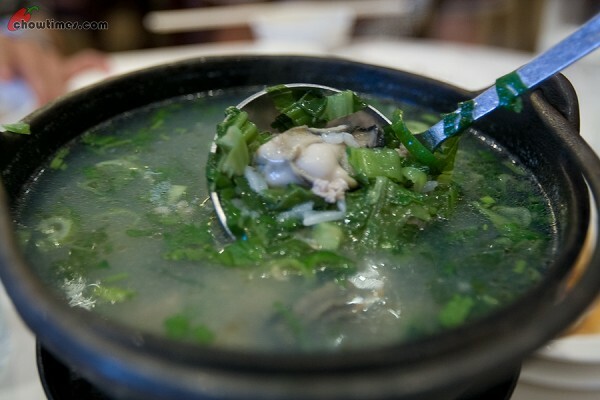 This one we had in Shanghai River is called Mini Oyster and … Pickled Vegetable Rice in Soup ($8.80). The picture on the menu looked nicer but then of course most pictures on menu look nicer than it really is. We enjoyed this. 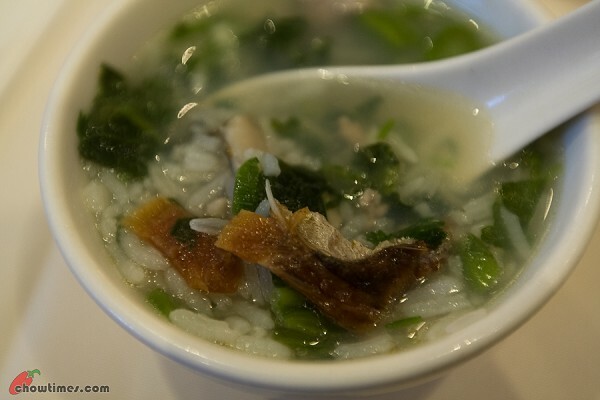 The rice is not mushy and that is good, otherwise it will be like eating congee. So this is still technically a soup. I like the pieces of fried fish and ground pork on top of the oyster. That combination gives a good contrast on texture and taste. 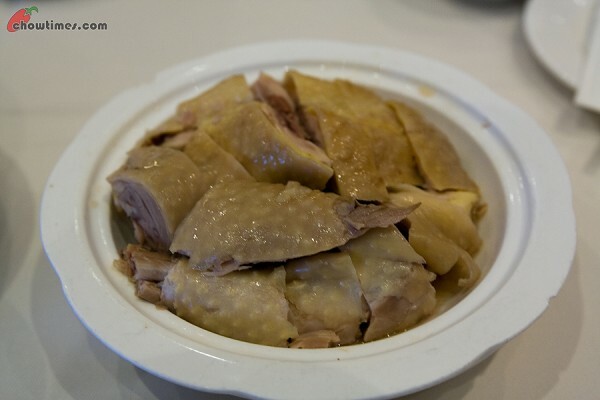 The Hua-Diao Chicken is also known as Chicken with Wine ($6.80). It is served cold. It was also flavorful with a very strong wine taste to it. They balance the flavour of the chicken quite well with the wine. While the wine is strong the meat stands out. Well done. The Szechuan Spicy Chicken Ball is just $7. We like this one too. 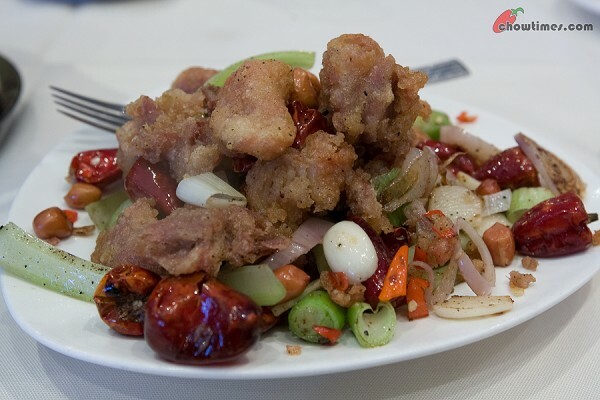 It is deep fried chicken with chili, peanuts, shallots, celery, garlic and green onion. They even have Thai birdseye chili too. Very interesting combination of taste — I would almost say “explosive”, if you know what I mean. I just love the crunch and the searing heat of the chili once released on the tongue. You like pain? This is it. We decided to get dessert and opted for the Sticky Rice with 8 flavours ($6.50). We can have this one deep fried or steamed. We wished we can have BOTH and see what the difference is. But we did not. We decided on the steamed version. 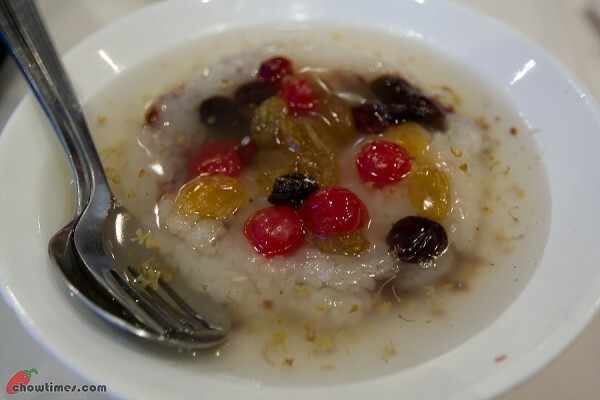 It is sweet sticky rice with cherries, raisins, red bean paste and apricot. Suanne and I love this. Our boys did not want to touch this even though we told them how great this is. I am sure once they take a bite they will want more but they are stubborn in not wanting to try. We love Shanghai River. The bill is $42 before tips. I think they are cheap but yet the dishes are well made. It is no wonder that they are that popular in Richmond. I can’t think of any bad thing about Shanghai River except for the wait. You, however, need patience eating here as they are busy. I want to add that they are a short 2 minute walk from the nearest Skytrain station. 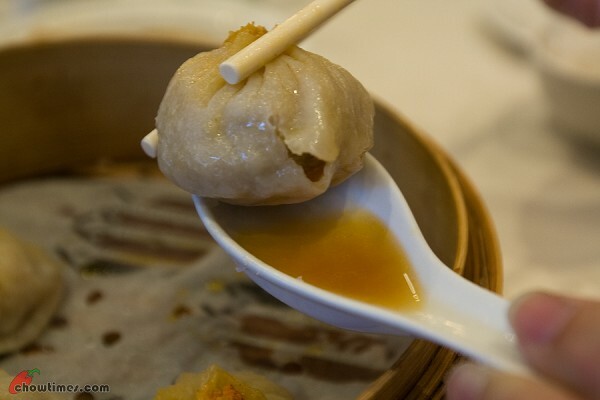 I’ve always loved my xiao long bao (steam soup buns), with the black vinegar. Why? Because it gets rid of the uhm, “meaty” taste, like how you would add ginger to rid of fishyness in soups…not sure if you get what I mean. But steam buns with slight dipping of the black vinegar (or even steam one with it drizzled on,) is totally awesome! You should give it a try next time. I always thought this place is pricy…will definitely try it out..i assume they hv fried rice too ??? I wonder.. Do they know who u are? Dont hey wonder why u take pictures even thr bill? I lije to take pix of the food we order just to post on fb, its a thing for my set of friends… And i agree the quality if ur pix are great! What kind of camera do you use? and do you use any special lens? your pictures are very sharp and artistic. I use a Canon 40D with a 16-35mm f/2.8 L lens 95% of the time. Between the two, the lens is what makes the biggest difference. I used to use the 17-40mm f/4 L lens but the 16-35 is better by far. Are you into photography too? Hands down one of the best overall Shanghainese restaurants in Canada, known for their “XLBs” (Thx ETE!). Hien Tai Fung in Markham, Ont. is also outstanding. I prefer the regular pork XLB over the more expensive crab meat; after all, how fresh could frozen hairy crab meat & roe from China taste. Try their fried prok chop noodles and pan fried buns “sang jin bao” next time. These are timeless Shanghai classics that your boys would like. The “Bai Yu Lan” restaurant on Park Ave & No. 3 also has very juicy XLB’s, but it has more modest ambience. I have liked Sticky Rice with 8 flavors as a small kid back then, but I haven’t had it in a long time. 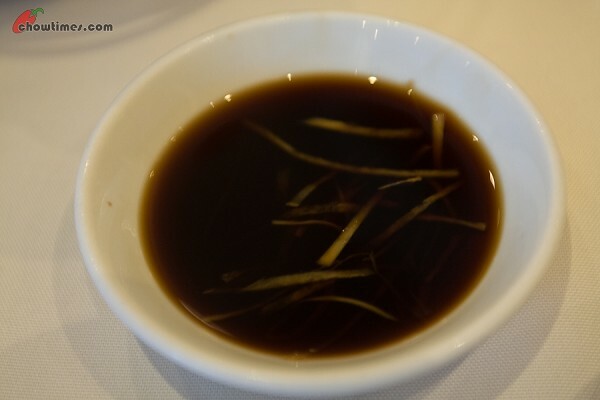 The version served here looks much different than what I had at Din Tai Fung (pretty much the only place that serves it that I know of in my area), due to the fact they have a pool of sugar syrup (?) that is served with the sticky rice. Never have seen that before. XLB looks great and fresh but from the photo I could tell these were dry on the outside. 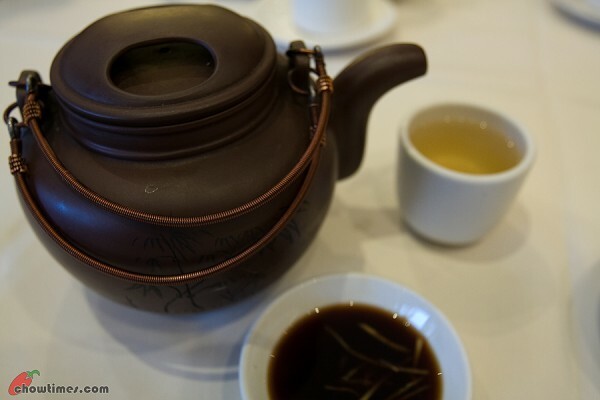 I also like that the tea is served in a red clay pot. Very nice! I haven’t seen any restaurant do that before.